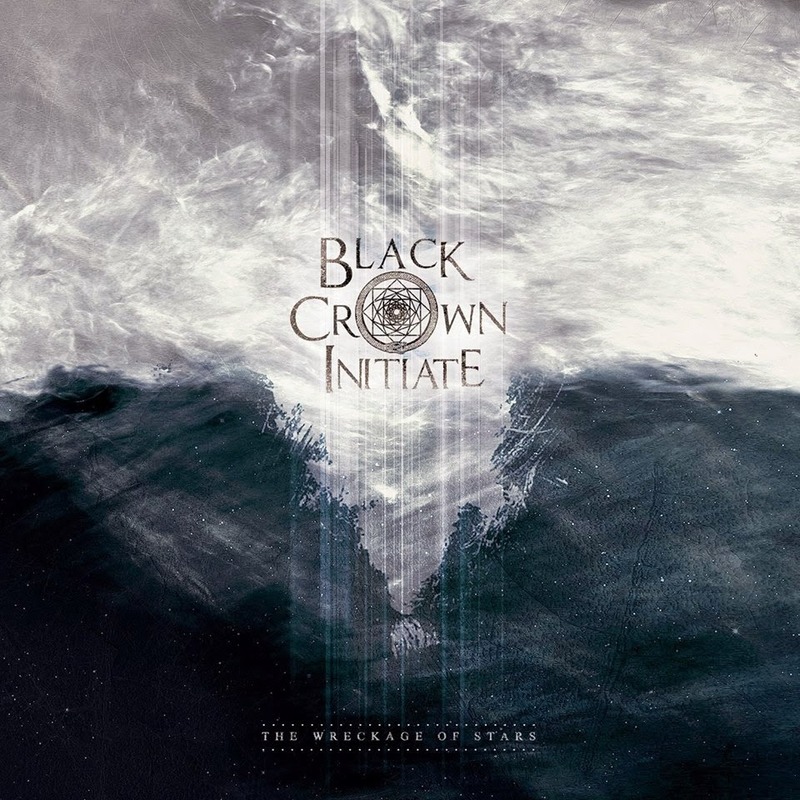 Hall of the Mountain King: Review: Black Crown Initiate, "The Wreckage of Stars"
My favorite track on The Wreckage of Stars, “The Malignant,” pretty much brings all of that together. It opens with a haunting clean guitar piece that explodes into the frantic musical equivalent of a 2×4 to the head. Guitarist and clean vocalist Andy Thomas delivers some soaring vocals as a counterpoint to James Dorton’s death growls. Thomas doesn’t have quite the power or depth of Opeth’s Mikael Akerfeldt when it comes to the melodic vocals, but who in the death metal arena does? The song eventually comes back around to another soft interlude that’s no less frenetic than the heavy parts with some slinky prog bass from Nick Shaw. It winds down with a mid-paced, but incredibly heavy section before fading out with that original clean guitar piece again. But back to “Withering Waves,” which is the song that hooked me. The progressive bent is on display early on in this one as Thomas delivers some sweeping and impressive guitar licks over bashing drums. Then we get to the chorus, which features some of Thomas’ best vocals on the record to my ear. And lest the heavier-than-thou segment of the death metal fandom think they can’t pummel you from start to finish, there’s “To the Eye that Leads You.” The tune is a blast of punishing violence almost start to finish, with some detuned, angular, djent-like riffing and only a few seconds of respite from the intensity in the form of a very brief clean guitar interlude. The song, I think, does go a little over the top on the chorus as Dorton cranks up the effects on his vocals until they’re just a formless squawk, but it’s redeemed with the fade-out riff, which is one of my favorite on The Wreckage of Stars. “The Human Lie Manifest,” another favorite track, reminds me quite a bit of something from the more melodic end of Carcass’ catalog. It puts me in mind of the band’s surprising comeback album from last year. The title track pauses the beating for a moment, opening with a haunting and ringing clean guitar piece. Electric leads and some symphonics swell behind that until we get a few crushing guitar notes. Surprisingly, though, the song doesn’t go for the kill there. Instead, it slips back into a prog mode as Shaw shows off his bass chops and Thomas continues to noodle. You keep waiting for that big blast of heavy, and they keep teasing you. Pounding drums build to what you expect to be an explosion, but it’s another tease, if only for a moment, as it fades back out before we really get to the heavy portion a little more than halfway through the song. But even it is firmly entrenched in the melodic. After that interlude, Black Crown Initiate dives right back into the fray on “Shape’s Collapse,” which is as heavy as “The Wreckage of Stars” is melodic. It’s not without its prog-influenced freak-outs among the blast beats, though. One of my favorite guitar pieces on The Wreckage of Stars is the opening of “Purge,” which features both eastern and Spanish influences. It’s overtaken quickly by the death metal portion of the sound, but returns on a chorus that’s one of the best on the record. This song might be the best blending of the heavier and more melodic styles on the record. Overall, Black Crown Initiate strikes a great balance between heaviness, technical proficiency and melody. There’s something that fans of pretty much any style of metal can enjoy on The Wreckage of Stars. You want heavy? They’ve got heavy. You want proggy breakdowns and virtuoso musicianship? You’re covered. You want catchy, memorable hooks and choruses. They’ve got those, too. Oftentimes, bands that have a little buzz around them don’t live up to that. Black Crown Initiate, on the other hand, deserves a much bigger buzz.